We are sad to announce that Linda Waterfall passed away in Seattle, Washington, on January 8, 2019, following a long illness. Linda left this world encircled by the love of people close to her. She was 69 years old. Linda was a dear friend to us, and performed at our very first house concert, in June, 2015. Her death is an enormous loss that will reverberate throughout the wide community of musicians, artists, fans, friends, and family who knew and loved her. 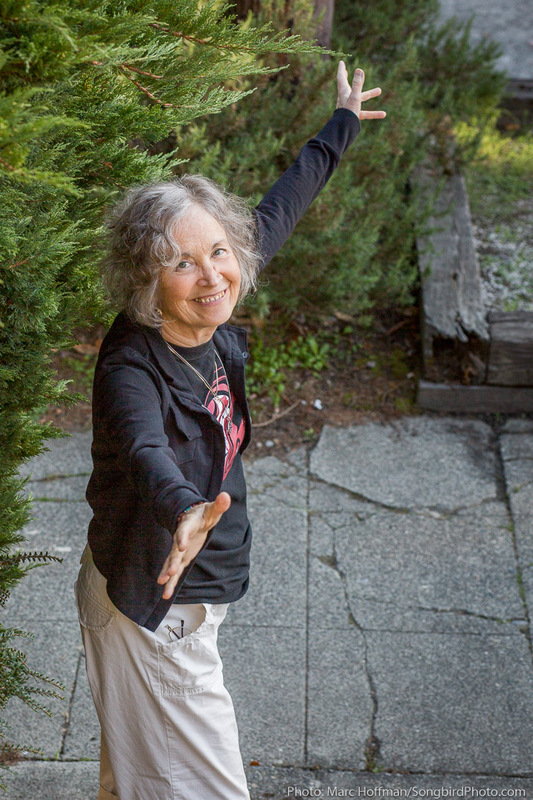 But it is well to remember the vitality and vibrancy Linda brought to her very full life and the lives of so many others—through her music, art, teaching, compassion, generosity, and keen intelligence. Her music reflected her classical training as well as a wide range of influences, including folk, jazz, blues, rock, and world music. Her ability to apply her personal genius to these styles resulted in a sound that was unique, beautiful, and celebrated. Over the course of her career, Linda was repeatedly named Seattle’s top singer-songwriter. Her 2015 album, Hometown Girl, was chosen by Seattle Times music critic Paul de Barros as one of his ten favorite albums of the year. And in 2016, readers of Seattle Magazine voted Linda one of Seattle’s 20 most-talented people. Linda was also a joyful and devoted spouse to Bob Searle, whom she married in 1996, and who preceded her in death in 2016. Linda and Bob shared a deep and affectionate bond that was plain for all to see. Although they lived in Seattle, it was at their small, river-side cabin in Forks, Washington, that they forged their fondest adventures and memories. To the surprise of those who knew her only casually, Linda loved to tell how, on summer evenings, they would sit together smoking cigars and sipping whiskey on the cabin porch. The gifts Linda embodied and shared are a legacy that, through her example and music, will continue to enrich all those who knew her and will continue to know her. Contributions in her name are encouraged. A list of organizations is listed on her website, www.LindaWaterfall.com. Read the Seattle Times postmortem article by Paul de Barros. This entry was posted in Uncategorized on January 13, 2019 by DuvallMarc.